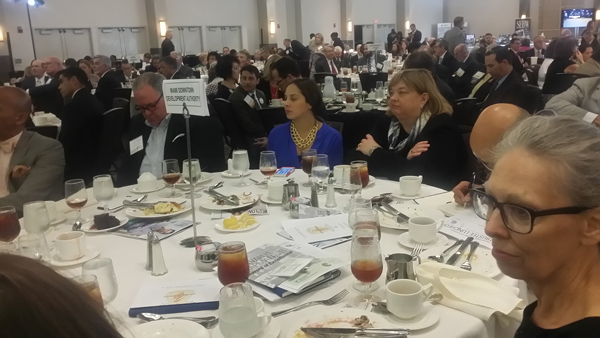 Sue Nelson, BNA Board Member Advisor to the EC, at the Downtown Development Authority (DDA) table at the Greater Miami Chamber of Commerce Awards Ceremony. On November 2nd, the Greater Miami Chamber of Commerce presented the third annual Alvah H. Chapman Jr. Award of Excellence for outstanding achievements on an individual, an organization and young leader who have made significant contributions and set standards for the development of Miami’s central business core’s economy, culture, promotion, education, beautification and preservation. Eduardo J. Padron, President of Miami Dade College (MDC) since 1995, the largest institution of higher education in America, with more than 165,000 students. He has elevated MDC to a position of prominence among the best US colleges and universities. Dr. Padron is recognized as one of the top educational leaders in the world. Swire Properties, the US real estate subsidiary of the Hong Kong and London based Swire Pacific Holdings Ltd. a 200 year old, listed multinational corporation. Swire Properties has been focused in the ongoing planning and development of Brickell Key in downtown Miami, investing about $1 billion in the creation of the premier urban mixed-use development in the U.S. For its individual properties and for Brickell Key as a whole, Swire Properties has achieved numerous industry and civic awards and commendations for design, construction quality and overall product merit. All that with a rigorous policy of environmental standards. Swire Properties assumes a leadership role in many civic and charitable organizations, reflecting a philosophy of giving back to the community that sustains it. Alice Bravo, Director of the Department of Transportation and Public Works (DTPW) since February 2016. DTPW is responsible for Miami Dade County’s entire surface transportation system, the planning, maintenance and operation of all roadways, transit system and taxi and limousine services. As Director, she oversees the Metrobus fleet, the Metrorail system and the Metromover. Since she first joined the city as Capital Improvements Director, overseeing a $573 million improvement program, she has participated in numerous projects, including the $1 billion PortMiami tunnel, the innovative I-95 Express Project and more, improving commuter mobility throughout Miami-Dade County. Biscayne Neighborhoods Association supports the Greater Miami Chamber of Commerce and congratulates those awarded for their many contributions to the community of Miami. Subscribe to receive all BNA communications. It is free and easy. Just use the form on our home page. Copyright 2017, Biscayne Neighborhoods Association | All Rights Reserved.